Kudos to Publicis Groupe and Digitas for imagining an all-digital advertising future, for planning to solve the deep structural problems of advertising 2.0, and for not sitting still while Google, Yahoo, and Microsoft take over the advertising industry. Beyond the growth potential, Publicis executives see these economies as important sources of low-cost labor for a Digitas subsidiary called Prodigious, a digital production unit that works with all agencies in the Publicis Groupe. Prodigious already uses workers in Costa Rica and Ukraine to produce copious footage for companies like G.M. Greater production capacity is needed, Mr. Kenny says, to make enough clips to be able to move away from mass advertising to personalized ads. He estimates that in the United States, some companies are already running about 4,000 versions of an ad for a single brand, whereas 10 years ago they might have run three to five versions. And he predicts that the number of iterations will grow as technology improves. It’s amazing that it’s taken this long for a major advertising player to take this step — and notable that it wasn’t one of the big Internet/tech players. This isn’t strictly an issue of cost savings, as with most offshoring — current ad agency human resources simply aren’t structured to scale to the level necessary to generate the enormous amount of ad creative necessary to deliver the kind of highly customized, ultra-targeted advertising that technology has made possible. Publicis has already put its money where its mouth is by acquiring Communication Central Group, a digital agency in China. While most media/advertising players are still trying to prop up the traditional media advertising economy, or like Google, trying to squeeze dollars out of it, Digitas is already planning for the inevitable all-digital advertising future. And David Kenny, the CEO of Digitas, is right that it’s consumer data that will drive all advertising into digital formats, as it becomes more and more difficult to rationalize the inefficiency of non-digital advertising. 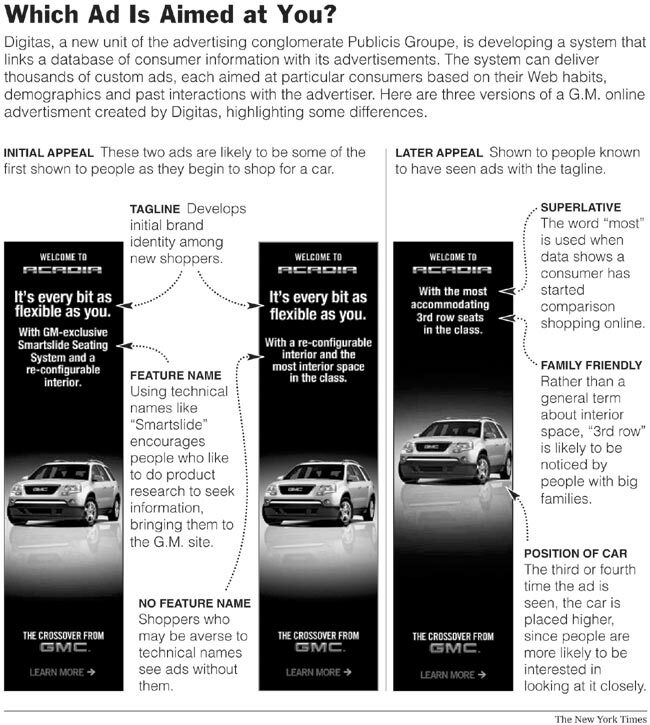 You can see what consumer data enables in these variations on a GMC ad — but as with all such targeting, there’s a “creepiness factor” that needs to be overcome. Nonetheless, it’s very likley that the future lies with this type of customization, as relevancy trumps privacy in the long run. Yahoo with its SmartAds platform and AOL with its acquisition of behavioral targeting pioneer TACODA are clearly aiming at that future. How do we see Google, Yahoo and Microsoft? It’s important to see that our industry is changing and the borders are blurring, so it’s clear the three of those companies will have a huge share of revenues which will come from advertising,” said Maurice Lévy, chairman and chief executive of the Publicis Groupe. While Google, Yahoo, and Microsoft, with their recent advertising platform acquisitions, see are betting they can create vertically integrated media and advertising companies, Publicis is betting — as it must — that advertisers will be wary of the fox selling the hen house. For self-serve search advertising, that horse is already out of the barn (to mix fram metaphors), but the drama is still yet to play out for the big video advertising dollars. My heart goes out to the CMOs and VPs of Advertising at big brand advertisers who are watching the media and advertising landscape transform right under their feet and are casting about form firm ground to stand on. Pull up a bowl of popcorn — the transformation of media and advertising is only getting more interesting.